A great story on some of these and more can be found at The Blaze, and excoriates the media for their participation in this smear. The newest addition to this crappy list, is Elliot Rodgers. Elliot is the the son of Hunger Games assistant director Peter Rodgers. Now of course Elliot didn’t go on a killing spree in the name of liberalism. And I believe that he, like many of the others, had a screw loose. But, I bet he came from a secular, liberal, Hollywood style upbringing that offered him nothing greater outside himself to battle the “natural man.” In fact, the ONLY political affiliation he chose to associate himself with both on his YouTube and FaceBook is the left-wing political talk show, The Young Turks. The host of the channel Cenk Uygur is a far left political activist and former MSNBC host. All I am saying is that Fox News wasn’t on his list. I looked both at his FaceBook and YouTube “likes,” and there were no religious or conservative interests in this young man. Nothing greater than nature challenging him to reign in feelings and test them with ethical religious mores. Moving on… and now I will go from the older posts to the more recent ones I have posted on over the years. I will concentrate mainly — but not exclusively — to murderers the media almost immediately blames the right on. 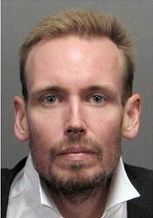 James Lee, the man police identified as the gunman who entered the headquarters of the Discovery Channel and took a group of hostages, was a self-styled eco-warrior and author of a manifesto describing humans as “the most destructive, filthy, pollutive creatures” destroying the planet. 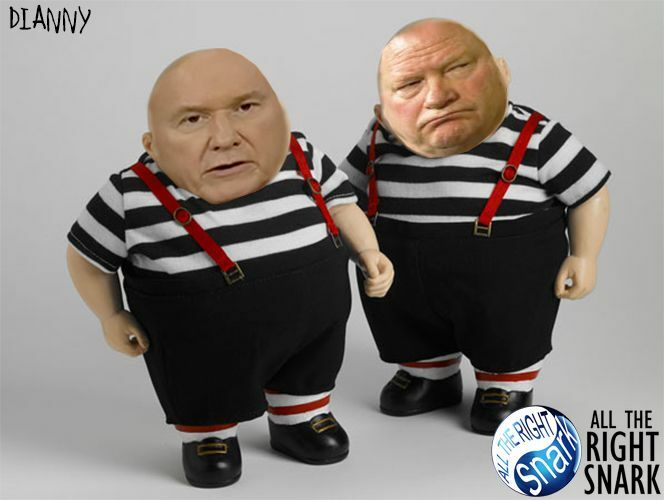 Lee waged a one-man campaign aimed at forcing the Discovery Channel to run programmes encouraging human sterilisation and wildlife preservation…. Humans are the most destructive, filthy, pollutive [sic] creatures around and are wrecking what’s left of the planet with their false morals and breeding culture. It is the responsibility [sic] of everyone to preserve the planet they live on by not breeding any more children who will continue their filthy practices. Children represent FUTURE catastrophic pollution whereas their parents are current pollution. NO MORE BABIES! Seems Mr. von Brunn wasn’t a big fan of the Iraq War and also believed that 9/11 was an “inside job.” Given this political sketch, Mr. von Brunn would feel at home at Camp Casey, Cindy Sheehan’s antiwar outpost in Crawford, Texas, and at the Daily Kos convention, rather than partaking in a National Review cruise with pro-Israeli war hawks Mark Steyn and Victor Davis Hanson. It’s not Charles Lindbergh’s Republican Party any more. And it hasn’t been for more than a half-century. But don’t tell that to the facile minds at the DHS [the Department of Homeland Security] and CNN. First Day Contrast: Keith Olbermann Called Tiller Shooting ‘Terrorism’ And A ‘Jihad,’ But Avoided Those Terms For Fort Hood. believed that 9/11 was an “inside job. The gunman identified by authorities in the Pentagon shooting, harbored intense anti-government feelings. ….Signs emerged that Bedell harbored ill feelings toward the government and the armed forces, and had questioned the circumstances behind the Sept. 11, 2001, terrorist attacks. That same posting railed against the government’s enforcement of marijuana laws and included links to the author’s 2006 court case in Orange County, Calif., for cultivating marijuana and resisting a police officer. Court records available online show the date of birth on the case mentioned by the user JPatrickBedell matches that of the John Patrick Bedell suspected in the shooting…. Shoot at the Pentagon and hate the military? Hate George Bush and the whole Bush family? Think 9/11 was perpetrated not by Muslims but by Republicans? Think the Vietnam War and the Iraq War were not merely mistakes but were part of a government conspiracy? …Michelle Malkin uncovered a key inconvenient fact which doesn’t quite fit this predictable “right-wing extremist” narrative — that Bedell was a registered Democrat. 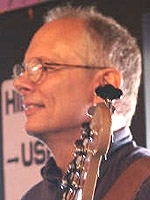 Bedell was also a marijuana smoker, grower and activist, as documented at Gateway Pundit. Patterico has now posted a full transcript of one of Bedell’s internet rants — the same one cited by Talking Points Memo as evidence of his right-wing leanings — which has Bedell uncorking phrases like “economic justice” and paragraphs like (writing in 2006 during the Bush presidency) “This organization, like so many murderous governments throughout history, would see the sacrifice of thousands of its citizens in an event such as the September 11th attacks, as a small cost in order to perpetuate its barbaric control. This collection of gangsters would find it in their interests to foment conflict and initiate wars throughout the world in order to divert attention from their misconduct and criminality. The true nature of such a regime would find its clearest expression in Satanic violence currently ongoing in Iraq.” and anti-war conspiracy theories like “The political and military disasters such as the wars in Vietnam and Iraq that an illegitimate coup regime uses against the people…”. Add all that to the previous discovery already linked above that Bedell’s Amazon “Wish List” featured the the left-wing conspiracy-theory books The Immaculate Deception: The Bush Crime Family and Family of Secrets: The Bush Dynasty, the Powerful Forces That Put It in the White House, and What Their Influence Means for America. So, which state-run media outlet will be the first to claim this Bush-hating Truther is a tea party activist? …We’ll have to wait and see. 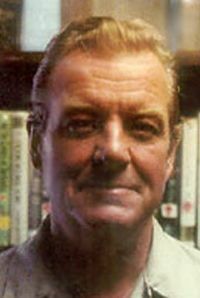 In the meantime, the Christian Science Monitor was the first to call the pot smoking, Bush-hating, Truther a right wing extremist. For the record, 35% of democrats believed Bush knew about the 9-11 attacks in advance. 99.9% of the left were Bush-haters. UPDATE: So… Will the state-run media report this? The Pentagon shooter is linked to several gay rights groups along with PETA, NPR, various drug legalization orgs, Greenpeace and Al Franken. Hmm. So when was the last time you ran into a “right wing extremist” who was a big fan of Al Franken? UPDATE: The media’s “right wing extremist” is a registered democrat. Another guy the press immidiately tried to connect to the T.E.A. Party. It was pointed out that much of what the IRS Joseph “the bomber” Stack talked about was directly from Michael Moore movies. The things said in his manifesto seem to all be taken straight from Michael Moore movies? ….Facebook profile, he lists his political views as “anarcho-communist,” and lists “#OccupyCleveland” as his employment. Sherrod Brown, the senior United States Senator from Ohio and a member of the Democratic Party. There are more bios of the above clowns HERE. Former security guard Nkosi Thandiwe was found guilty of murdering a woman and wounding two others during a shooting spree in July of 2011 and has been sentenced to life without parole, CBS Atlanta reports. He confessed to the crimes during his testimony last week, adding some chilling details about his motivation. And prosecutors argued that Thandiwe was fueled by racist hate against whites. “My mind was blank at the time,” he said — but he still remembers what prompted the violence by his own twisted rationale. He cited anti-white ideas he learned at university. He said the night before the shooting, he attended a so-called “Peace Party” intended to address his concerns about helping the black community find equal footing, but two white people were there. …Thandiwe took the liberal propaganda the entire country has been marinating in for decades at face value. Like Colin Ferguson, he was sufficiently unstable to be set onto a maniacal killing spree by the vile poison of politically correct ideology. This deranged far left shooter. 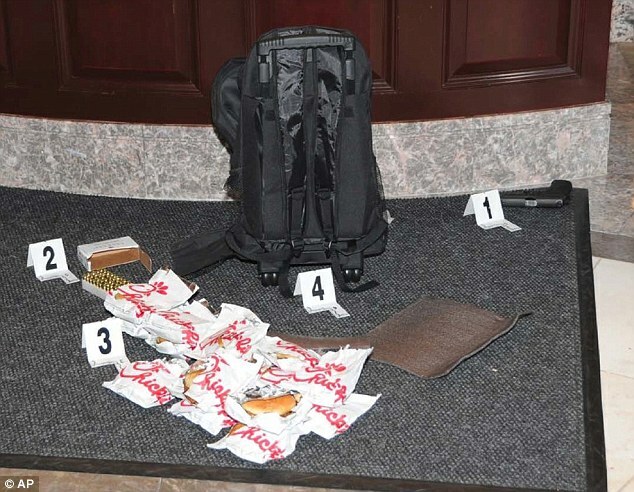 A LGBT volunteer carrying bag of Chick-fil-A sandwiches shot up the conservative Family Research Center in August 2012. The armed man who walked into the Washington headquarters of the Family Research Council and shot a security guard was later identified as Floyd Corkins, 28, of Virginia. Fox News reported that Corkins posed as an intern and was carrying a Chick-fil-A bag with him during the attack. He admitted he got his information from the far left Southern Poverty Law Center website. Corkins said he intended to “kill as many as possible and smear the Chick-Fil-A sandwiches in victims’ faces, and kill the guard.” The prosecutor said they reviewed the family computer and found that he identified his targets on the Southern Poverty Law Center’s web site. ….Militant atheism may also be a factor in the shooter’s motives. Nietzsche is the well-known atheist philosopher who decried the “slave morality” of Christianity and proclaimed “God is dead”. The shooter in the Garielle Giffords case (Jared Lee Loughner) was a militant atheist. Militant atheists like Richard Dawkins and the American Atheists group have even called for the eradication of Christianity. But the vast majority of atheists are not violent. On the other hand, aggressive violence is forbidden to authentic Bible-believing Christians because Jesus did not shed anyone’s blood. Authentic Christians debate and persuade using evidence, because that’s what Jesus did. The most we could do is participate in a just war like the Korean War or the Gulf War. Christians stopped slavery. Christians save unborn babies. We’re for strict non-violence. 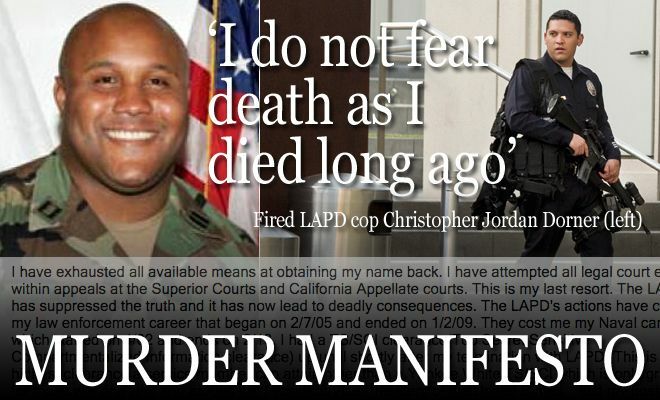 What is being reported as Mr. Dorner’s manifesto not only endorses Hillary Clinton for president in 2016 and vigorously defends Barack Obama and the Democrats’ current gun control push; he also savages the NRA’s Wayne LaPierre while expressing all kinds of love for some of the biggest stars in the left-wing media — by name. Nope, not a T.E.A. Partier. Wait. 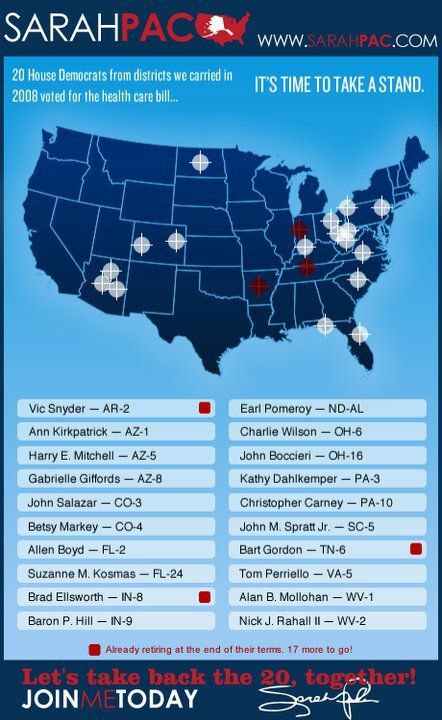 I don’t understand… if Sarah Palin draws targets on a map for important Democratic races, and she is tied with violence via the shooter of Gabrielle Giffords (via the flyer to the right). Then at what point is the press responsible for the wild accusations they make? More bad news for the media came in the gunman’s weapon of choice: a shotgun, which is also Vice President Joe Biden’s weapon of choice…. Of course this goes with the LONG list of violent leftists shooters, as my “BIO’s” at my old site and my new site show. Here are more examples of edited parts of the story that has been built about this shooter… why edit this stuff out? Unless you are shamed that the shooter is giving what you believe in (as most journalists and editors at major newspapers do) a bad name. The below comes via the I.J. Review, in a piece entitled: “Denver Post Shamefully Omits Key Detail About Arapahoe High Shooter,” the emphasized portions were removed. 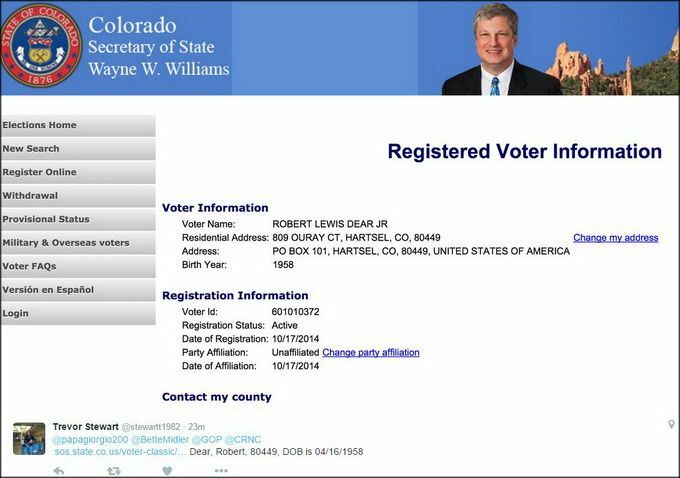 Robert Lewis Dear, Jr. from Hartsel, Colorado is registered to vote in Park County, Colorado as a woman. And his party affiliation is UAF! UPDATED INFO: UAF may stand for “Unaffiliated,” thanks to Trevor Stewart for the kind correction! …Robert Lewis Dear, the suspect in the shooting at Planned Parenthood in Colorado Springs, appears to have posted religious rants and solicitations for women on the website Cannabis.com, and also had a dating ad at SexyAds.com. 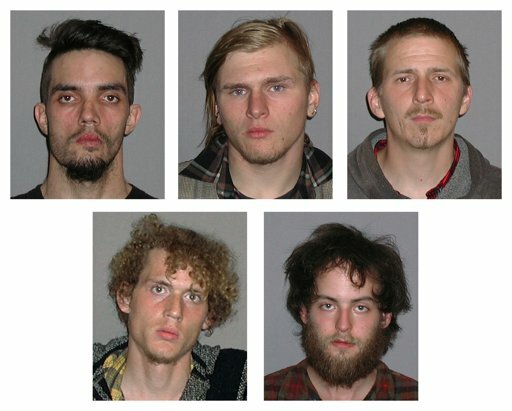 Dear’s posts on the Cannabis.com message board were first uncovered by the New York Times. A dating profile on SexyAds.com has the same username Dear used when posting online…. The “white Christian terrorist” refrain has been a constant drumbeat among the activists who smell blood in a terrible story that seems to confirm every outlandish bias they hold about pro-life Americans. Robert Lewis Dear, Jr. from Hartsel, Colorado is registered to vote in Park County, Colorado as a woman. Maybe society will deal with the instability of people who suffer GID (gender identity disorder)? I pray for the families involved of the death of their loved ones. Add this guy to all these “right wing extremists“! Nidal Hasan (Ft Hood Shooter): Registered Democrat and Muslim. 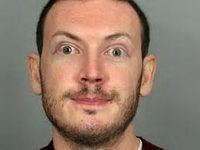 James Holmes: the “Dark Knight”/Colorado shooter: Registered Democrat, staff worker on the Obama campaign, #Occupy guy, progressive liberal, hated Christians. But — this site (beyond the compassion felt for lost loved ones) is also a site to defend against the craziness out there. I have seen stupid posts by people who hate Planned Parenthood saying they do not care if a worker at PP lost their lives, to the media saying this is a right-wing motivated attack. All of it dumb. But when the media (not bloggers or tweeters ~ see one example below) hops in on this, then I post rebuttals like this one below. 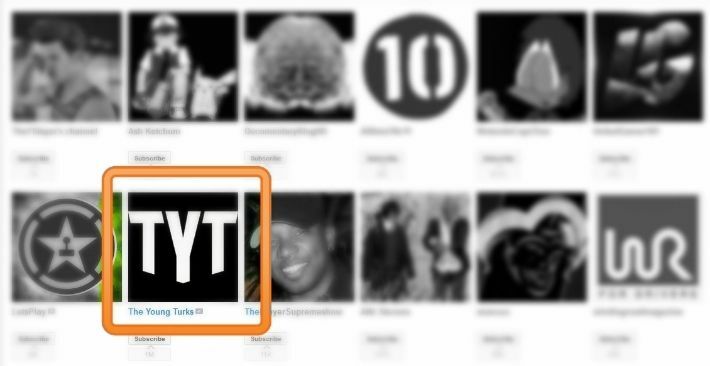 Example from Jezebel… this site blames in part the undercover videos released. Even claiming these are edited — even though they have been released in full [without any edits] for the skeptics to watch. Of course there many “false flag” (not in the conspiratorial sense that is used) arson, poop swastikas, and graffiti against lesbians ~ by those who then claim “hate” has been used against them or their community. Thanks for the simple act of listing this under terrorism. The gymnastics people are displaying to avoid that word/ definition of this act staggers my mind. This man is an actor in an invisible war. The resistance to calling him what he is, a terrorist, is the embodiment of white, christian ideological supremacy. The constant refrain of ‘we need to know more!’ but what more could we possibly need to know? This entry was posted in Crime, Psychology and tagged Chris Dorner, Crazed Gunmen Bios, Crazy Liberals, Elliot Rodgers, Floyd Corkins, James Holmes, James von Brunn, Joe Stack, John Patrick Bedell, Karl Pierson, Nkosi Thandiwe, Violent Democrats. ← Did Jesus Believe in Adam and Eve? Do You?